The Vault is a room in the Sanctuary Fortress that houses the Screw Attack. It consists of multiple platforms surrounding a locked Luminoth Vault Chamber containing the Screw Attack in the center of the room. 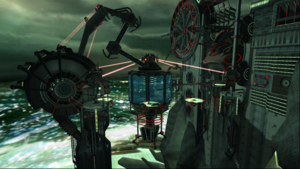 Four of the platforms have Luminoth Laser Turret that can be aimed with Spinners. Only after aiming all four turrets at the Vault Chamber can the lock be released allowing acquisition of the Screw Attack. When Samus first enters the room, she lowers the bridge, making it impossible to leave, but simultaneously allowing access to a nearby Portal. Samus must go into Dark Aether, only to exit soon using a nearby Portal. She can then access the Spinners and rotate the Turrets. The Vault houses four Rezbits on the platforms surrounding the Vault Chamber, likely placed to deter intruders. During any subsequent visits to the room, it will be uninhabited. This page was last edited on 10 October 2013, at 01:07.